In accordance with the [governing coalition’s] "Agreement on Defense 2013-2017", the selection process for the new fighter type has been restarted. According to the [coalition] agreement, the fighter selection process must be restarted as soon as possible with a view to a political decision on the type before the end of June 2015. There has now been an agreement between the [coalition] parties, and the selection process for the new fighter has resumed. The Ministry of Defence, in cooperation with the Armed Forces, has set up a program organization to prepare the type selection. • Type Selection process for new fighter aircraft, which were suspended in mid-2010, is now starting up again. COPENHAGEN, DK --- With an official press release, the Danish Ministry of Defence has confirmed rumors that it has started a new competition to select a fighter aircraft to replace the Danish Air Force’s fleet of F-16s. The evaluation is part of the Danish multi-year planning for 2013-2017, and it is intended to prepare a final political decision on the new fighter in June 2015. Denmark is a JSF partner country (development contribution in 2002), but will hold an open competition. It is the second country to re-evaluate an earlier decision in favor of the Joint Strike Fighter. In December 2012 Canada also decided to hold a new and open competition and cancelled the sole-source decision (2010) to procure the F-35 after a very critical report by the Parliamentary Budget Officer and another by KPMG. The competition was frozen in April 2010, but Boeing, Eurofighter, Lockheed Martin and Saab all received an official letter on March 13, 2013 informing them that the Danish MoD had resumed the purchase process for new fighters. Dassault Aviation has not been invited to compete, and will not attempt to do so, company chief executive Eric Trappier told defense-aerospace.com after the company’s March 14 press conference in Paris. He said that the European partners are the least likely to withdraw from the Joint Strike Fighter program. He added that this explains why Dassault did not re-compete in the Netherlands, which he said had made a lot of noise about holding a new competition but had ultimately stayed with the JSF. “It probably allowed them to obtain a better price from the Americans,” he said. Last autumn some preparations were made by visiting US manufacturer Boeing and the JSF Program Office. Remarkable is the confirmation that the Eurofighter Typhoon has been invited to re-enter the bidding process, after leaving it in 2007. Eurofighter withdrew in December 2007 from the Danish and Norwegian competitions, as it believed that both “competitions” were skewed in favor of the F-35 Joint Strike Fighter. The Royal Danish Air Force (RDAF or Kongelige Danske Flyvevåben) has one main operating base located at Skrydstrup, with one fighter wing with two multi-role frontline squadrons (Esk 727 and Esk 730). A total of only 30 Lockheed Martin F-16AM/BM is still operational. Most of the two-seat 16BM are operated by Esk (Sqd) 727 in its training role, while Esk (Sqd) 730 contributes to the NATO Rapid Reaction Force. The RDAF’s last operation was during the military intervention in Libya in 2011 when six Danish F-16s operated from Sigonella in Italy. In 2004, 2009 and 2010 the RDAF contributed to the NATO Baltic Air Policing operation in Lithuania. In the 1960s and 1970s the RDAF operated a number of US-financed Lockheed F-104G Starfighters, North American F-100D and F-100F Super Sabres, and a fleet of Saab Draken fighter aircraft. The Danish Parliament knows a decision will have huge influence on the defence procurement budget for nearly a decade. The operating and support cost will also affect the entire defense budget over the next 30-40 years. Therefore, low long-term operating and support costs are of critical importance for Denmark. The comeback of Eurofighter is the most interesting aspect of the Danish decision. It could well prove a relatively strong candidate, because it is used by close NATO allies Germany and Britain. Also Germany is a very important trading partner and the most important country for Danish exports. 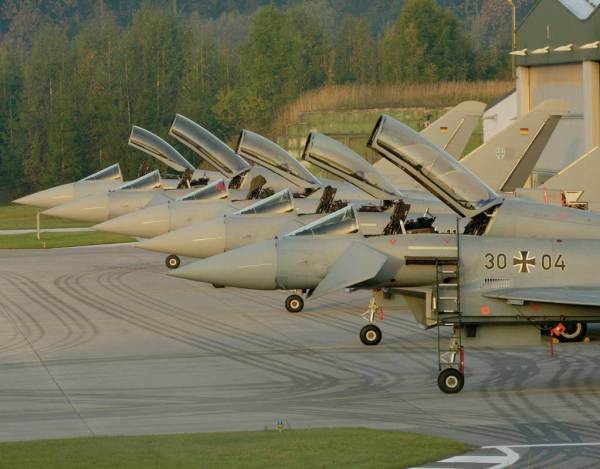 There is some speculation about a possibility for Denmark to buying Tranche 3B Eurofighters destined for the German air force, or buying used Eurofighters Tranche 1 or 2 versions from Germany, so that Germany can upgrade to the new Tranche 3b version. There were no legal or evaluation conditions that could give objections to a comeback of Eurofighter in the competition. Other candidates are the F-35 from Lockheed Martin; the Boeing Super Hornet and Saab’s Gripen Next Generation (now designated Gripen E). There is requirement for 24 to 32 fighter aircraft, depending on price and budget. Eurofighter Typhoon joins the New Danish Combat Aircraft Competition targeted at safeguarding Denmark’s national air defence. Eurofighter CEO, Enzo Casolini, said: "We welcome the invitation of the Danish Government and we are pleased to enter into this international competition. The Eurofighter programme has strong reliability in terms of delivery and price. The aircraft itself is an effective, proven and trusted weapon system. A decision in favour of Eurofighter Typhoon would be a long-term investment into Denmark’s security and defence. Selecting Eurofighter Typhoon which is fully NATO-compatible would lead to reduced costs for Denmark with respect to logistics, training and interoperability during coalition missions. 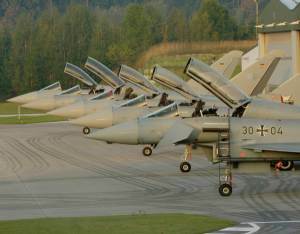 Since entry into service in 2004, more than 350 Eurofighter Typhoons have been delivered to six nations: Germany, the United Kingdom, Italy, Spain, Austria and Saudi Arabia. In December 2012, Oman became the seventh customer and ordered a total of twelve aircraft. Currently, Eurofighter Typhoon is in service at 20 operational units and up to now, the whole fleet has completed about 170,000 flying hours worldwide.